Inside Line did a quick test of the Nissan GT-R several weeks ago, but now post the full test with all the details. They bring up a good point about the driving dynamics of the Nissan GT-R. Has the person that is making claims that the car is boring to drive, actually driven a GT-R? 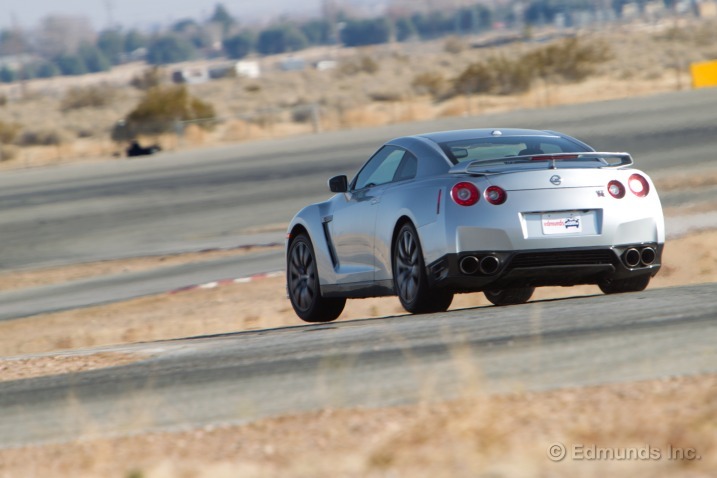 "The GT-R is boring to drive" and "The GT-R is easy to drive" are statements trotted out by the Internet infidel crowd so often they've become trite. Quite apart from the fact that one must actually have driven a GT-R to make such an observation authentic, these claims are simply no longer true. From Inside Lines testing, even with the additional 15 horsepower of the 2013 model over the 530 hp of the 2012, the 2013 was not any faster than the year earlier car. A dramatic all-four-tires-spinning launch netted 60 mph in 3.1 seconds (2.9 seconds with a 1-foot rollout like at a drag strip) and finished off the quarter-mile in 11.1 seconds at 123.3 mph, identical to the 2012 model, other than that car's slightly higher trap speed of 124.1 mph. Once again proving its better to boil than bog off the line. You want a balance of wheelspin to forward motion, to keep the car up in the rev range. If you bog, you have to make those RPM's all up again, and the car is nearly always a bit slower. Video and a link to the full article after the break.